What is Renewable Solar Energy? Renewable solar energy is a source of electricity that implements the sun’s rays to generate power for homes and businesses. It is considered renewable solar energy because the sun does not run out of power, therefore it is a fully sustainable resource. A sustainable resource is one that either cannot be used up, or it renews itself quickly enough to maintain a steady supply. The use of renewable solar energy continues to grow in nearly every area of the planet. This is due to rising concerns regarding the use of fossil fuels and other limited resources. Not only are the earth’s fuel supplies dwindling, but there are many links between oil based fossil fuels and global warming. The earth’s atmosphere is slowly becoming hotter, resulting in uprooted or diminished eco-systems in many parts of the world. If this trend continues, global disaster could result. To avoid the crisis that global warming could create, researchers and environmentalists have developed exciting new ways to create energy generating sustainable resources. Renewable solar energy is one of the oldest and most widely used sustainable energy sources. It is clean and non-polluting, it doesn’t run out, and it is widely available. In order to use renewable solar energy, scientists had to create something that could capture the sun’s power and then convert it into electricity that people could use. Thus, the solar panel was born. Solar panels are small squares of tinted glass that absorb the sun’s energy and transport it through small wires located on the under side of the panel. While being transported, the power is harnessed and generated into electricity. During solar energy’s infancy, panels were often more expensive than the average consumer could afford. 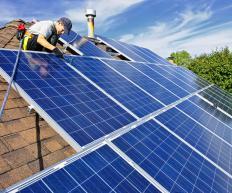 There were also very few companies available to install the panels on the roofs of homes and businesses. Luckily, things are changing very quickly and renewable solar energy is available in hundreds of cities across the world. This more widespread availability has also made solar power more affordable to the masses and the prices continue to drop as more economical panels are created. Even families who cannot afford to buy large and more sophisticated solar panels can benefit from renewable solar energy. Smaller panels are often available, as well as how-to guides for self installation. This can make acquiring solar energy as a supplemental power source a more feasible option for consumers, as every little bit can make a big difference for the environment. What is a Renewable Energy Council?